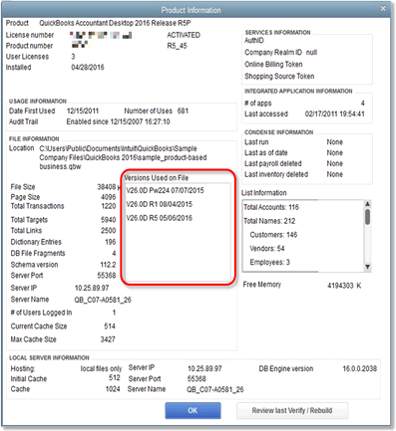 Learn how to find the version and release of your QuickBooks product. Before you can do any troubleshooting on your QuickBooks product, it's important to know the version and release you use. We help you find the version and release information you need. As well as show you how to update your Quickbooks. The following section provides the steps to find the version and release for your QuickBooks Desktop, and how to update it. With QuickBooks Desktop open, press the F2 key. In the Product Information window, find the release on the Product line. To learn how to update QuickBooks Desktop for Windows, see Update QuickBooks Desktop to the latest release. With QuickBooks Desktop open, press the F2 key or Ctrl+1. In the Product Information window, find the Versions Used on File section. To view the version and release in QuickBooks Desktop for Mac, open QuickBooks Desktop, and, from the Help menu, select Product Information. To learn how to update QuickBooks Desktop for Mac, see Update QuickBooks Desktop to the latest release. In QuickBooks Desktop, from the Reports menu, select QuickBooks Statement Writer (QSW). When the program opens, select Help, and select About QuickBooks Statement Writer. The version information is found in the About window. From the Reports menu, open QuickBooks Statement Writer. Select the Help Center, and select Update. In QuickBooks Desktop, from the Employees menu, select Payroll Center. Select the Payroll tab to view the Subscription Status window. To download the latest payroll update, see Download the latest payroll tax table. To check the POS version and release, from the Help menu, select About Point of Sale. The edition and version appear in the Product line at the top. To learn how to update QuickBooks Point of Sale, see Update QuickBooks Point of Sale for Desktop to the latest release. There is no version or release available for Merchant Services or Payments since QuickBooks is used only as an entry point to the Merchant Services (IMS) server.